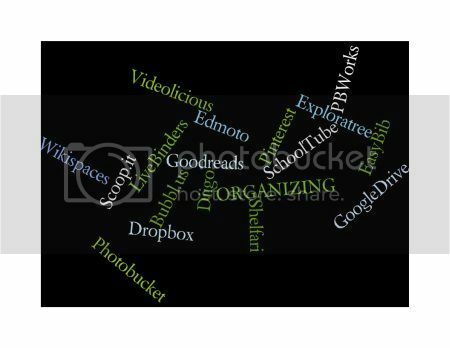 Use these tools to help organize your information, whether it be in text, image, or video format. Some of these tools allow you to create interactive lists. Bubbl.us – Basic mind map creator. Diigo – A bookmarking site that allows you to annotate and archive websites. Choose to keep your information to yourself or share. Also an app. Dropbox – Free online/cloud storage of up to 18 GB (extra storage costs more). Also an app. EasyBib – Free bibliography and citation generator. An alternative to do-it-yourself or Noodlebib. Also an app. Edmodo – Social networking for teachers ad their students. Post discussions, embed images, links, and videos. Exploratree – Free templates for graphic organizers. Goodreads – Virtual shelf where you can organize books you want to read, are reading, or have read. You can also create lists, write reviews, and create private or public discussions. Also an app. Google Drive – Allows you to store all files, documents, images, and videos AND allow others to access and/or edit them. A great tool if working with a partner or group or using a variety of digital tools. Must have a Gmail account. LiveBinders – Organize PDFs, Word files, or URLs in a book-like view with tabs. PBWorks – Create an interactive space for your classroom. Includes storing class resources, parent outreach, and online interaction. Pinterest – Organize and share images and inspirations. Also an app. Photobucket – Online photo editor and image hosting. Also an app. Schooltube – A place for teacher and students to share videos. An alternative to YouTube. Scoop.it – Browse or create topics where you can add static or dynamic content along with descriptions. An alternative to Pinterest. Shelfari – Virtual shelf where you can organize books you want to read, are reading, and have read. You can also read reviews, discussions, and questions about your book. Owned by Amazon.com and requires an Amazon I.D. to access. Videolicious – Create multimedia presentations using music, video, images, and audio. Free 1-minute presentations. Also an app. Wikispaces – Create a collaborative space for sharing content with your class or peers. An alternative to PB Works.